Happy Groundhog Day! Punxsutawney Phil has spoken, and it looks like we’re all in for another six weeks of ColdPRO Winter Additive in our fuel. Markets in the north certainly got a taste of that this week, with temperatures dropping into the negatives overnight in a few midwestern markets. Markets are trending lower this morning despite news that OPEC compliance remains strong. It’s been a volatile week, with $1 price-swings not uncommon. As crude prices track higher, larger price swings become common even while percentage swings stay the same. 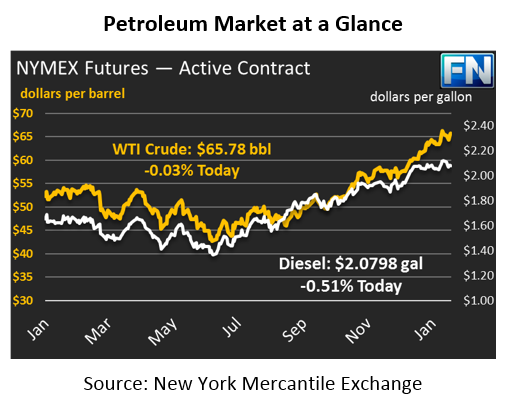 Markets gained $1.07 yesterday, and today crude prices are currently trading nearly unchanged at $65.78. Refined products are struggling to gain traction this morning. Diesel gained 2.4 cents yesterday during the day, but today diesel prices are stagnating, falling 1.1 cents (-0.5%) to trade at $2.0798. Gasoline barely moved throughout yesterday’s trading session, ending the day just .11 cents higher. Today, gasoline is in the red, trading 1.5 cents (-0.8%) lower than yesterday’s close, with prices at $1.8804. Reports of OPEC compliance have received mixed reactions in the market. Some point to the group’s compliance as proof that supplies will continue falling in 2018. Others acknowledge the supply cuts so far, but argue the majority is a result of flagging production in Venezuela. Either way, given that Venezuela doesn’t appear close to a turning point, the result is low production either way, so markets are still enthusiastic. The US Dollar fell yesterday, giving additional support to crude prices. Absent other news to drive markets, the dollar has been an important factor in oil volatility lately. Markets were expecting today’s jobs report to come back with bearish undertones – in fact, job growth outperformed expectations, adding 200,000 jobs in January. Earnings were also higher, leading to a strengthening dollar this morning and headwinds for crude prices. Looking towards the remainder of 2018, major banks have been lining up to change their forecasts. Yesterday, Goldman Sachs revised their 2018 WTI price target to $72.50, a $15/bbl increase from the previous announcement. In Q2 and Q3, prices could even rise to $$75 or higher. Goldman indicated that market rebalancing efforts have been successful, and strong demand mixed with reduced OPEC supplies will create conditions for strongly higher prices this year.